Sometimes you cook food for pure enjoyment, and other times you just want a quick meal – but still want it to be flavoursome & nutritious, just a lot simpler. This is the perfect recipe for an evening in as it combines silky, luxurious, flavours but all in a recipe that’s on your plate within 30 minutes. You’re likely to have a lot of the basics handy in your cupboard making the recipe even easier, and it really is incredibly simple to cook! Start by prepping the chicken and removing any sinew. 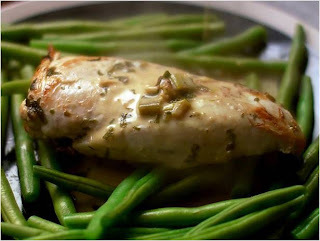 Keep the breasts whole as they will stay a lot juicier than in mini-fillets or chunks. Each breast should be a portion, so buy bigger pieces of meat for hungrier diners, or small ones for littler appetites. Start warming up a pan with a table spoon of olive oil, and add the clove of garlic to add a beautiful depth of flavour. As the oil heats up the oil will absorb all the garlic flavours, but make sure it doesn’t get too hot or it’ll burn. 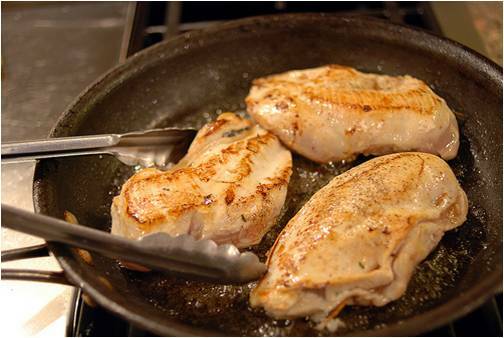 The pan shouldn’t be too big either, just the right size to house the chicken breasts snugly. Throw the spring onions and chicken on to a roaring sizzle and add plenty of salt and pepper, with two teaspoons of the dried tarragon. The chicken will continue to brown and seal, which is what we’re aiming for. Don’t try to cook the breasts through, just leave them on their side until the flesh goes lovely and golden with small green flecks from the tarragon. Once the chicken is brown you can add the 150ml of dry white wine. The aroma will immediately kick off as the alcohol evaporates. Remove the garlic, but add in a teaspoon of the fresh tarragon to enrich the depth of flavour. Dried and fresh herbs have different flavours, but they complement each other well and work great with fresh chicken in a recipe like this. Now it’s time to cover up the pan with a lid and leave the meat to cook through. Turn the heat down and leave the pan for around 10 minutes. This is where you want to get your green beans on too, so just add them to a pan of boiling water, with a touch of salt to season. Test the meat is cooked by slicing open the thickest part of the breast to reveal soft white meat. Place some plates in the oven to gently warm as you check that the beans are coming along and remove the breasts from the wine infused sauce and put them in the oven to keep warm. Add the 125ml of double cream to the wine sauce and add more pepper and fresh tarragon in the pan. Stir it all together and allow the flavours to infuse for just a couple of minutes. Don’t let the sauce burn but allow it to thicken slightly. Serve the chicken with a generous helping of green beans and liberally pour the creamy cooking liquor all over the plate. Finish with fresh tarragon and enjoy. It’s really that easy, and the strong tastes and succulent meat will make anyone think you slaved away hours preparing a slow oven based dish. The secret is between you and me. You’d be surprised at the quality of takeaways offering gourmet dining in Dublin with Just-Eat, so take a look for yourself if you’re not in the mood for cooking. Okay, you got me... This is being cooked tonight for sure! Recipe printed and off to the shops shortly :) Looks like with will be one very awesome meal!